There were several things that my experience at NC State did to help me in my current role as president of Durham Technical Community College. One thing it did was expose me to the whole world of community college because at the time of my training, I had little experience with that institution. I was taught the mission of the community college was in changing lives and supporting the community and how my role as a leader would facilitate that mission. The curriculum was built to create leaders throughout the North Carolina Community College System. I was exposed to great leaders in the field and to like-minded, fellow students in the program at the same time who contributed to a rich context for learning. A number of my peers have gone on to be presidents and leaders at other community colleges: Steve Thornburg at Cleveland Community College, David Johnson at Johnston Community College, Algie Gatewood at Alamance Community College, and Augusta Julian at Bluegrass State Community College in Kentucky, to name a few. Phail Wynn, my mentor and predecessor at Durham Tech is also a graduate of the Adult and Community College Education program in the College of Education. Nobody could have predicted the challenges North Carolina community college leaders would face today back when I started the program in the 1980s. What the program did to prepare us for this time was to teach us how to face uncertainty. It did this by providing a broad-based theoretical training and practical experiences. These provided me with enough background to weather the storm of political and economic changes that impact the community college. I have often reflected on the course I took with Dr. Ed Boone on programming. This provided a basis for my role as a leader in the role community colleges should play—as an agent of change in a community. While still a student, I built my education philosophy around the community college’s policy of open access. If we focus on our mission as change swirls around us we can carry out that mission successfully. The advice that I would give to students who are training to be leaders is don’t be afraid to not be the smartest person in the room. Find people who are smarter than you and listen to them as you move forward. There is a tendency for a person in a leadership role to feel that they should know everything and make all decisions alone. This perception is compounded as people repeatedly come to the president’s office for counsel and advice. It is impossible to know everything and to make all decisions effectively without the information provided by experts. You should cultivate the practice of listening and encourage your advisers to share their advice readily with you. My leadership team brings me information from the financial side, the academic side, the student services side, and the technology side of our institution. You have to have people who are smarter than you to help you lead the community college. Your job as a leader is to provide guidance for decisions, to motivate and inspire, but always to encourage smart people to speak up and to listen to what they have to say. I am glad to see that NC State is helping fill the leadership pipeline in the community college system. Over the course of the next five or ten years, other leaders will need to emerge as sitting leaders who emerged from the College of Education in the 80s and 90s start to move on. I’m pleased NC State is helping prepare the next generation of our system’s leaders. 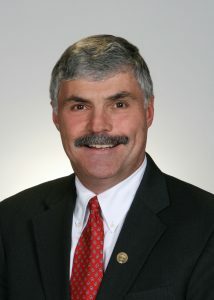 William G. Ingram became President of Durham Technical Community College in 2008. Dr. Ingram was formerly Durham Tech’s Senior Vice President and Chief Instructional Officer, Dean of Technical and Vocational Programs, and Director of Off-Campus Programs. He holds a Bachelor of Arts in English from Ohio Wesleyan University and Master of Science and Doctorate in Education degrees in Adult and Community College Education from North Carolina State University. He is a graduate of the advanced Community College Leadership Program of the American Association of Community Colleges. He has also completed the Leadership Durham and Leadership Triangle programs, and is a 1987 graduate of Leadership Chapel Hill-Carrboro. Dr. Ingram serves on the Board of Directors of the Greater Durham Chamber of Commerce and the Chapel Hill-Carrboro Chamber of Commerce. He also serves on the Board and on the Executive Committee of Made in Durham, an organization dedicated to ensuring the community’s youth are well positioned to obtain meaningful employment in the local economy. He is a former Trustee of SACS-COC (the higher education accrediting body for the southern region) and is past President of the Downtown Durham Rotary Club. He is past President of the North Carolina Adult Education Association and is a former member of the Community College Review Editorial Board. He has published articles on community college governance, funding, and leadership.